A native of Winthrop, Maine, Bob has been integral to the growth of S.W.COLE. After receiving a B.S. 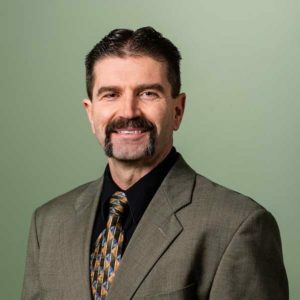 in construction management technology from the University of Maine in Orono, Bob joined the firm in 1990 as an Engineering Technician and helped launch our office in Gray, Maine. The firm later promoted him to the position of Geotechnical Engineer, and in 1999, after S.W.COLE acquired the former operation of Morrison Geotechnical Engineering, Bob moved to our new Winslow, Maine office and oversaw its eventual move to Augusta, and then Sidney, Maine. He particularly enjoys working on projects involving soft compressible soils. After serving as the firm’s executive vice president for several years, Bob was named President and CEO in 2014. Bob, who received his master’s degree in geotechnical engineering in 2004, is the manager of the Bangor office, and is Chairman of the S.W.COLE Board of Directors. His duties at S.W.COLE include project management and technical review, office management, strategy and direction, client and employee engagement and financial monitoring. Meeting with clients and employees is his favorite part of the job, and he is passionate about driving S.W.COLE’s team culture.